It makes me so sad to read of ignorance like this and like this. I went to school. I even got to read poetry in school, and it was wonderful. But it was in my local public library where I first remember falling in love with a book of poetry; taking it home, cherishing the words, marvelling at the beauty contained within those pages which even as a child I had access to… to my delight and with an engendering of empowerment. And that generosity, the library’s generosity, the library’s existence, contributed to a lifetime of reading, writing, buying books, working in the arts, working, as I do now, in a very special library — the Scottish Poetry Library, whose holdings and activities bring poetry and joy to more than thousands of people around the world… who then go on to invest even more of themselves, and often their money, into poetry and literature. The number of times I’ve heard people say that they’re taking a look at a book in the library which they’ll then go on to purchase if they love it in order to have it in their own personal collection… the number of events we host in which poets are celebrated and their books are purchased… to say that libraries don’t contribute not only to the encouragement of the very act of reading but also to the act of the financial support of writers is ludicrous. 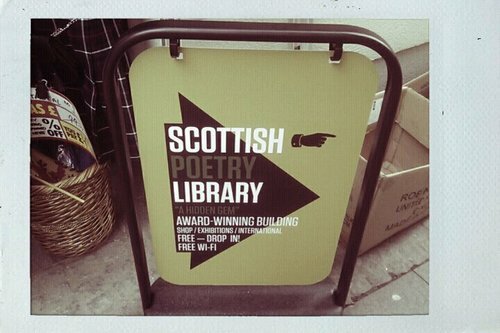 The Scottish Poetry Library, like most other libraries, couldn’t exist without public funding, and what a loss it would be if it ever ceased to exist. What a loss it is to think of the children in Moray not having a place to go where they can discover the power and poignancy of words for themselves. What a loss it is to think of a community without support for its artists, its theatre makers, its writers, its poets and the people who would like to experience the beauty of what these makers create. I have yet to meet an artist or writer who doesn’t feel burdened by the need to make a living, to submit their time and creativity to the hungry maw of the commercial world in which we live, and it is through funding, and the occasional gift of patronage in its various guises, that many artists and writers find a tiny oasis in which to breathe, think, make. Shame on those who seem to think we live in a world where there is no more poverty, where everyone can afford to buy a book, where everyone is fit and able to participate in the marketplace. Shame on those who think a poet could make enough money to live on by selling their books (though wouldn’t it be nice!). Shame on those who would rather see an artist submit to market forces than be offered the gift of freedom to create. My first book, Condition of Fire, was written thanks to an Edwin Morgan Travel Bursary that allowed me to go to an extraordinary place and take the time to be and see and experience and taste and feel and write, and write, which I would not otherwise have been able to afford to do. I’d like to think that was a worthwhile use of that money. I’d like to think that the many kind people who have bought my book think it was a worthwhile use of that money, and also the people who take my book out of the library. I do think that the arts, at least in the world we’re living in, need public support — politically, physically, financially. Yes, we’ve all been to that performance or read that poem written on a funded residency that didn’t do it for us, or seen that example of public art that didn’t add to the beauty of its surrounds. But haven’t we, most of us, also seen something that’s taken our breath away, heard music that’s made us weep, read a book that’s made us remember a lost moment of joy… in a library, in a theatre that’s been publicly-funded, in a concert hall that couldn’t exist without the help of an arts council. And finally, to say that because libraries are old means they’re now useless is also mind-boggling, and another sad reflection of our culture which doesn’t seem to value age in any of its forms, especially in its older people; one of our greatest resources… the beautiful, wrinkled, aged, storied wise who so often are overlooked rather than celebrated and learned from. And it’s worth the investment of looking after them, and of spending time with them, and of talking to them about the poems they love… a conversation you could probably have for free.